2. Epidemiology and Biostatistics Unit, AUSL Teramo, University of L'Aquila, L'Aquila, Italy. The growing interest in enhancing and spreading colorectal cancer (CRC) screening has been stimulating the exploration of novel biomarkers with greater sensitivity and specificity than immunochemical faecal occult blood test (iFOBT). The present study provides i) a systematic review of the urinary biomarkers that have been tested to achieve early CRC diagnosis and assess the risk of colorectal adenoma and adenocarcinoma, and ii) a meta-analysis of the data regarding the urinary prostaglandin (PG) metabolite PGE-M.
As regard to gene markers, we found significantly different percent methylation of the vimentin gene in CRC patients and healthy controls (HC) (p<0.0001). Respect to metabolism of nitrogenous bases, cytidine, 1-methyladenosine, and adenosine, have higher concentrations in CRC patients than in HC (respectively, p<0.01, p=0.01, and p<0.01). As regard to spermine we found that N1,N12 diacetyl spermine (DiAcSpm) and N1, N8 diacetylspermidine (DiAcSpd) were significantly higher in CRC than in HC (respectively p=0.01 and p<0.01). Respect to PGE-M, levels were higher in CRC than in those with multiple polyposis (p<0.006) and HC subjects (p<0.0004). PGE-M seems to be the most interesting and promising urinary marker for CRC and adenoma risk assessment and for CRC screening. In conclusion, evidence suggests that urinary biomarker could have a potential role as urinary biomarkers in the diagnosis of colorectal cancer. Particularly, PGE-M seems to be the most promising urinary marker for CRC early detection. Colorectal cancer (CRC) is a highly common malignant tumour; it has been estimated that 1.13 million new CRC cases are diagnosed every year and that CRC causes about 694,000 deaths per year [1,2]. CRC has become a major public health concern, because despite treatment as many as half of patients die from the disease . One reason for such high mortality rate is that CRC is a silent disease, since specific signs such as bleeding and abdominal pain often arise only in patients with advanced tumour stages ; as a result, Dukes' stage C is found at diagnosis in half of the patients, whose 5 year survival is <50% [5-7]. CRC is sporadic in 90% of patients; in <10% it is inherited [8,9] or is a complication of inflammatory bowel disease, either ulcerative colitis or Crohn's disease [10-12]. Even though treatment approaches have considerably improved over the past decade, they have not exerted commensurate effects on outcomes or survival of patients with advanced disease. Moreover, they have induced a steep rise in treatment cost. Several modelling studies have demonstrated that a number of screening strategies are cost-saving . In the majority of cases, CRC develops from a preclinical benign precursor, adenoma; progression from early adenoma to invasive cancer takes years [14, 15]. High incidence, protracted preclinical phase, recognisable and treatable precursor, high cost of treatment, and correlation of mortality with disease stage make CRC highly suitable for population screening [16, 17]. Faecal occult blood test (FOBT) has shown several limitations as an early diagnosis tool . The growing interest in enhancing and spreading CRC screening has been stimulating the exploration of novel biomarkers with greater sensitivity (SE) and specificity (SP) than the gold standard (immunochemical FOB test [iFOBT]) and capable of being detected in blood , stools and urine [20-22]. Some studies have compared the values obtained with urinary and serum markers  and others have compared these with the FOBT , thus increasing their diffusion and the interest in developing laboratory techniques capable of detecting specific molecules. Several markers have been vetted, including nucleosides , the methylation level of specific genes [23,24], species deriving from oxidative stress , spermine concentration [27-29], and enzyme activities [30,31]. In the past decade, urinary prostaglandins (PG) have been examined as possible early markers of high-risk adenoma (HRA) [32-35]and adenocarcinoma [35, 36]. The present study provides: i) a systematic review of the urinary biomarkers that have been tested to achieve early CRC diagnosis and assess the risk of colorectal adenoma and adenocarcinoma, and ii) a meta-analysis of the data regarding the urinary prostaglandin (PG) metabolite PGE-M. Relevant studies were identified using MEDLINE, EMBASE, Scopus, Clinicaltrial.gov, Web of Science, and Cochrane Library searches up to August 2015. The search strategy used the following terms: Urinary Biomarkers AND Colorectal Cancer; Urinary Biomarkers AND Colorectal Tumour; Urinary Biomarkers AND Colorectal Adenoma; Biomarkers AND Urine AND Colorectal cancer; Biomarkers AND Urine AND Colorectal tumour; Biomarkers AND Urine AND Colorectal neoplasm; Biomarkers AND Urine AND Colorectal adenoma. Papers were selected using the PRISMA checklist . A manual search was also made. Only studies in English published in the previous 10 years were included. The references of all studies were screened by two independent reviewers (PMA and GL); a methodologist (EA) resolved any disagreements. Inclusion criteria were adult clinical studies and investigations of urinary biomarkers of CRC, including case-control, nested case-control, and early detection studies. Exclusion criteria were in vitro studies, studies validating laboratory techniques, prognostic studies and studies published as proceedings. The general characteristics of the papers thus selected are summarised in table 1. The odds ratio (OR), reported in the studies, are listed in table 2. The SE, SP, positive (PPV) and negative predictive value (PNV), and receiver operating characteristic (ROC) curves of all urinary markers examined are shown in table 3. Among the urinary markers explored to date, PGE-M has been examined in five studies involving more than 1000 patients. These data were subjected to a meta-analysis. Data reported as medians and interquartile ranges were transformed into mean and standard deviation (SD) as described by Pudar Hozo et al . Participants were considered as healthy controls (HC) if adenoma/adenocarcinoma had been excluded by colonoscopy; as patients with low-risk adenoma (LRA) if they had a solitary adenoma <1cm in diameter; or as patients with high risk adenoma (HRA) if they had multiple lesions, adenomas >1cm in diameter, or lesions showing a high degree of dysplasia. Pools standardised mean differences were evaluated according to Cohen  and analysed with the random-effects model according to Der Simonian and Laird . Quality assessment of case-control studies was conducted with the Newcastle-Ottawa scale ; the last item of outcome/exposure assessment was not used because it was not appropriate (Supplementary table S1). Search of the electronic databases according to the above-listed criteria found 282 papers; the manual search found 7 papers, totalling 289 papers. There were 25 duplicates (figure 1); 214 papers were excluded because 28 were conference posters, 54 were reviews, 84 regarded other subjects, 30 were animal, in vitro or laboratory technique studies, and 18 evaluated blood/serum/plasma or other tissues. 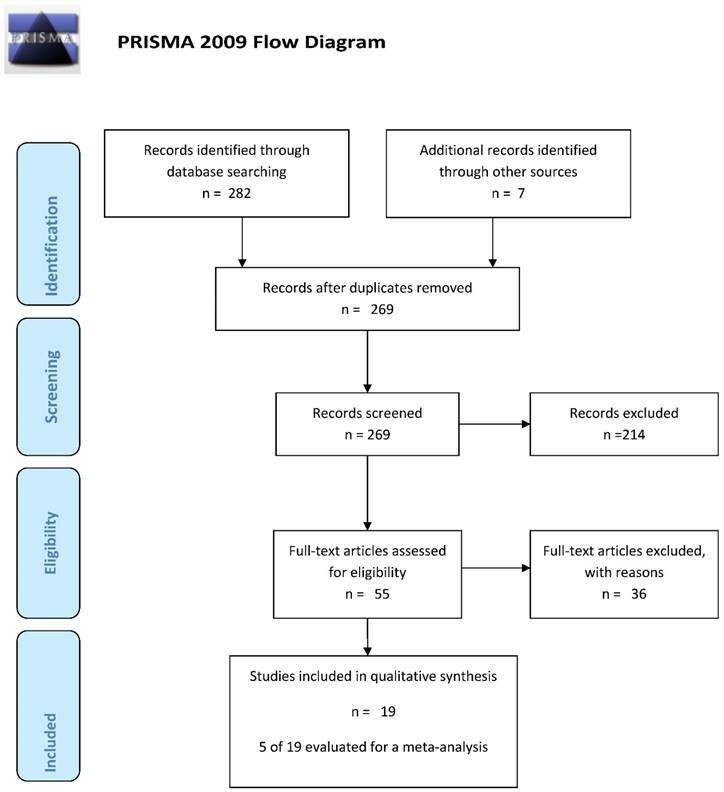 Examination of the remaining 50 papers in the second stage of the PRISMA flow chart led to the exclusion of 31studies for the following reasons: 5 were reviews [1,19,42-44], one assessed animals , 5 involved laboratory technique validation [21, 46-49], one was a molecular biology study , 4 were survival analysis studies [51-54], 7 assessed the impact of dietary habits [57-61], 5 did not examine urine [62-66], one reported aggregate data for CRC, gastric cancer and pancreatic cancer , and finally 2 did not match the inclusion criteria [68,69]. The general characteristics of these papers are reported in table 1. Since they assessed multiple biomarkers, they were grouped as follows. A study of the methylation of vimentin, ALX-4, and Wif-1 genes  has found significant differences between CRC patients and HC only for the Wif-1gene (p<0.0001) (table 1). However, despite high SP values, SE was very low (table 2) . Song and co-workers have described significantly different (p<0.0001) percent methylation of the vimentin gene in CRC patients and HC (table 1) . As reported by Xiao and colleagues, NDRG4 methylation provided an SP that ranged from 78% (blood) to 91% (tissue), whereas SE ranged from 8% (paracarcinoma tissue) to 81% (carcinoma tissue) in table 2 . LEGEND: PGE-M¹: Cancer vs non cancer. PGE-M²: Cancer/large polyps small/no polyps. DiAcSpm: N¹,N¹²-diacetylspermine. DiAcSpd: N¹,N8-diacetylspermidine. Several studies have assessed nitrogenous bases as disease markers. Rozalski and co-workers investigated 8-oxo-7,8-dihydro-2'-deoxyguanosine, 8-oxo-7,8-dihydroguanine, and 5-hydroxymethyluracil. Group data and the main findings are reported in table 1, whereas SP and SE values are listed in table 3 . Hsu and colleagues examined cytidine, 1-methyladenosine, and adenosine, among other metabolites, and detected higher concentrations in CRC patients than in HC (respectively, p<0.01, p=0.01, and p<0.01; table 1). They also calculated SP and SE (table 2) . Cheng et al found no differences in nitrogen metabolites among the groups, but described differences in the ROC curves (table 2) . Feng and colleaguesmeasured13 metabolites in CRC patients and HC (table 1) and reported the ROC curve data (table 2) . Zheng and co-workers assessed 13 urinary metabolites in CRC patients and HC and found that they were consistently higher in patients (table 1) . Niu and colleagues investigated arylsulphatase (ARS) activity in patients with CRC, patients with adenoma, and HC. Data stratification by gender highlighted significant differences among groups (p<0.0001). The SP, SE, PPV, PNV and ROC curve data are reported in table 2 . Szajda and colleagues examined urinary hexosaminidase (HEX) activity in CRC patients and HC. They found higher HEX enzyme (HEX, HEX A and HEX B) activity in relation to Dukes' stages A (p=0.03668), C (p=0.02396) and D (P=0.00552). Moreover, the HEX B complex provided an SE of 84.2% and an SP of 90.9%, whereas the area under the curve (AUC) was 0.89. The other values for HEX A and the HEX complex are reported in table 2 . El-Masry and colleagues measure urinary carcinoembryonic antigen (CEA) in different malignant gastrointestinal diseases. The relevant SE, PPV, and PNV values are listed in table 2 . There are two papers on spermines [27, 28]. Umemori and co-workers examined N1,N12diacetylspermine (DiAcSpm) and N1, N8 diacetylspermidine (DiAcSpd) in various groups of subjects (table 1) and found that both were significantly higher in cancer patients than in HC (respectively p=0.01 and p<0.01). They also calculated the SE of the two markers (table 2) . Hiramatsu et al. investigated HC and patients with CRC, breast cancer (BC), and benign gastrointestinal disease (table 1), but only calculated the SE and SP values of urinary spermines (table 2) . These were investigated only by Chandramathi and colleagues in four groups of subjects. CRC patients showed significantly higher levels than BC patients and control subjects (table 1) . There were five papers assessing urinary PGE-M: four compared patients with adenoma and HC [32-35] and two compared cancer patients and HC [35,36]. The general characteristics of the study populations and the differences among groups are reported in table 1; the SE and SP values are showed in table 2 and the risk estimates are reported in table 3. Johnson and colleagues have assessed the possible role of PGE-M as an early diagnostic marker in five groups of subjects (table 1). PGE-M levels were higher in CRC patients than in those with multiple polyposis (p<0.006) and HC subjects (p<0.0004). Davenport and colleagues (table 3) devised a risk model where they considered urinary PGE-M as well as plasma C-reactive protein (CRP). Although none of the associations achieved statistical significance, the risk tended to increase in patients with poorly differentiated lesions on histopathology and higher levels of the two markers . b: additionally adjusted for cigarette smoking, alcohol consumption, BMI, red meat intake and NSAID use. Bezawada and colleagues (table 3) found significant OR in HRA patients (p=0.04) having higher PGE-M levels compared with controls. In LRA patients, none of the risk estimates were significantly related to PGE-M levels (p=0.30). PGE-M values were not associated with a significant risk in smokers or in those who had stopped smoking(p=0.45). Adenoma patients with a body mass index (BMI) >25 (p=0.43) were not at significantly greater risk in relation to PGE-M levels compared with HC. In contrast, HRA patients with a BMI <25 were at greater risk than controls; the risk was double in case of higher PGE-M levels (p=0.02). Risk differences between cases and controls in relation to PGE-M levels were not affected by consumption of non-steroidal anti-inflammatory drugs (NSAID) (p=0.18) or by high or low calcium values (respectively p=0.09 and p=0.24) (table 3) . In the paper by Shrubsole and co-workers, the risk assessment model, based on urinary PGE-M and histological type, was adjusted for age, gender, education, ethnicity, smoking habits, BMI, and consumption of alcohol, NSAID, and red meat (table 3). In patients with "any advanced adenoma", adjustment for gender, ethnicity, age, and education yielded increased and significant OR in Q3 and Q4, whereas the adjustment for cigarette smoking, BMI, and alcohol, red meat, and NSAID consumption involved an approximately twofold greater risk in the third quartile for cases compared with controls. Notably, in the group of "multiple small tubular adenoma" (MSTA) all risks were increased and significant after adjustment for all the confounding variables included in the model. The same was true of patients with "advanced or multiple adenoma "when they were not stratified by gender. Gender stratification involved very high OR in women with high PGE-M compared with HC in the fourth quartile (table 3). As regards NSAID consumption, a twofold greater risk was found among those who had never taken them in the third and fourth quartile of PGE-M, whereas among users the risk was increased in all PGE-M quartiles for cases compared with controls . Cai and co-workers reported an increased risk with the increase in PGE-M levels in cases compared with controls for all CRC patients (p<0.001). Remarkably, in CRC patients with a disease duration >30 months, higher PGE-M levels were associated with an increased and significant risk (<30 months, p=0.35; >30 months, p=0.012) (table 3) . The present review highlights that PGE-M is the most frequently assessed marker. The studies published to date have examined the whole CRC spectrum, from benign adenoma to advanced cancer stages. Despite their limited amount, the samples analysed in the various papers were found to be sufficient for a meta-analysis, except for the study by Johnson and colleagues . The present meta-analysis aims to assess whether differences in urinary PGE-M among patient groups are statistically significant. The following groups were compared: patients with a single small tubular adenoma (LRA); patients with advanced adenoma or adenoma showing a high degree of dysplasia (HRA); and patients with MSTA, though not all papers included the latter. The results of the comparisons are reported below. LRA vs. HC. In this comparison the standard mean difference (SMD) was not significantly different (z=0.21; p=0.836); heterogeneity chi-squared was 2.90 (d.f.=3), p=0.408, and I-squared (change in SMD attributable to heterogeneity) was 0.0% and estimate of between-study variance tau-squared <0.0001 (Figure S2). HRA vs. HC. This comparison yielded z=5.12; p<0.001, heterogeneity chi-squared=4.61 (d.f.=3), p=0.203, I-squared =34.9%, and estimate of between-study variance tau-squared=0.0049 (Figure S3). HRA vs. LRA. The data found for this comparison were as follows: SMD z=5.83; p<0.001, heterogeneity chi-squared=0.48 (d.f.=3), p=0.924, I-squared =0.0%, and estimate of between-study variance tau-squared<0.001 (Figure S4). MSTA vs. HC. The following data were obtained for this comparison: SMD z=1.00, p=0.316; heterogeneity chi-squared =6.71, p = 0.010, I-squared=85.1%; and estimate of between-study variance tau-squared=0.0565 (Figure S5). CRC vs. HC.SMD z=5.09, p<0.001 and heterogeneity chi-squared=1.13 (d.f.=1), p=0.287, I-squared =34.2%, and estimate of between-study variance tau-squared=0.0031 (Figure S6). Research into diagnostic tests has provided a number of non-invasive assays for use in CRC screening that include DNA, RNA and protein biomarkers in faeces, blood, and urine [32,73-77]. Several urinary markers have been investigated, including epigenetic modifications, oxidatively modified DNA bases, nucleosides, enzyme activities, various metabolites (glycolysis, tricarboxylic acid[TCA] cycle, urea cycle, pyrimidine, polyamine and gut microbiota metabolism), oxidative indices, non-enzymatic antioxidants, CEA, and PG metabolites (especially PGE-M). As regards epigenetic modifications, abnormal DNA methylation is an early event in carcinogenesis, and several abnormally hypermethylated genes have been identified in CRC patients [78-80]. Hypermethylation of CpG-rich sequences (CpG islands) in tumour suppressor genes has been reported in CRC neoplastic tissue and in premalignant lesions . Since aberrant DNA methylation is found in stool, serum, urine, and other body fluids, such DNA could be used as a biomarker for cancer screening [82-84]. With reference to epigenetic markers, significant hypermethylation of the vimentin gene has been found in CRC patients compared with controls . In a cross-sectional study, Amiot and colleagues measured the methylation levels of Wif1, ALX-4, and vimentin genes, selected from a panel of 63 genes, in urine, stool, and serum . These markers showed a good specificity but a low sensitivity for early cancer detection (table 2). Since oxidative stress related to chronic inflammation is associated with CRC etiology, Rozalski and colleagues assessed urinary excretion of oxidatively modified DNA bases/nucleoside (8-oxo-7,8-dihydroguanine, 8-oxo-7,8-dihydro-2'-deoxyguanosine and 5-hydroxymethyluracil) in HC, adenoma patients and CRC patients . Although urinary DNA changes may reflect the oxidative stress/chronic inflammation found in CRC [85,86], its performance in early diagnosis is moderate . The levels of advanced oxidative protein products (AOPP), hydrogen peroxide (H2O2), malondialdehyde (MDA; a marker of lipid peroxidation), and ferric reducing antioxidant power were determined in urine from BC and CRC patients , and AOPP, H2O2 and MDA were found to be significantly higher in CRC patients compared with control subjects and BC patients. Urinary nucleosides have been tested as biological markers of malignancy in a variety of cancers [87-90], but very few studies have addressed CRC. An investigation into urinary nucleosides from CRC patients and HC  has found higher mean levels of adenosine, cytidine, 1-methyladenosine in patients, even though they provided low SE (range, 27-69%). Feng and co-workers reported that the levels of 11 of 14 urinary nucleosides were higher in CRC than in HC subjects . The SE of the urinary nucleosides (76.9%) was higher than those of CEA (38.5%), CA19-9 (40.4%), CA125 (15.4%), and AFP (17.3%). A comparison of the urinary concentrations of 14 nucleosides in healthy subjects, patients with intestinal villous adenoma, and patients with CRC found that the concentrations of 12 nucleosides were significantly elevated in CRC patients, whereas only the concentrations of four nucleosides were higher in patients with intestinal villous adenoma compared with healthy subjects . In CRC patients, the SE of urinary nucleosides was 71% compared with the 29% of CEA. Mean nucleoside concentrations were significantly lower in patients with intestinal villous adenoma than in CRC patients. Moreover, the level of 1-methylguanosine, pseudo-uridine, and 1-methyladenosinepositively correlated with tumour size and Dukes' stage. The activity of several enzymes is altered in a number of cancers. Changes in the structure of membrane glycoconjugates and glycosidase and protease activity are important in tumorigenesis . Significantly higher activities of lysosomal exoglycosidase shave been reported in human glioma and kidney cancer tissue and in serum and urine from patients with pancreatic cancer and colon cancer [69, 91-95]. Β-HEX, a lysosomal exoglycosidase, releases terminal N-acetyl hexosamines from GM2 gangliosides, oligosaccharides of glycoproteins, glycosaminoglycans, and other carbohydrate-containing macromolecules . There are two major HEX isoenzymes: A (αβ), and B (ββ) . Szajda and colleagues have described a significant increase in the concentration of HEX and in the activity of isoenzymes HEX A and HEX B in serum and urine from CRC patients  compared with HC. The SE of HEX, HEX A and HEX B was 78.9%, 73.6%, and 84.9%, respectively. No correlation was found between the activity of HEX, HEX A or HEX B and histological type, Dukes' stage, degree of cellular differentiation, tumour size, or gender. Sulphatase family members share structural and functional similarities . They catalyse the hydrolysis of sulpha bonds from different types of substrates, e.g. glycosaminoglycans, sulpholipids, and steroid sulphates. The two main ARS isoenzymes, A (ARSA) and B (ARSB), are soluble and are located in lysosomes. In a retrospective study, Niu and colleagues assessed morning urinary ARS activity as a marker of tumour progression in normal controls, subjects with benign CR tumours and CRC patients  and found significantly higher values in the latter group. Moreover, morning urinary ARS activity was fairly effective in distinguishing patients with CRC from those with benign CR tumour. Several metabolic aberrations are associated with CRC, and significant metabolic changes have been described in CRC tissue . Serum and urinary metabolomic studies have found that CRC is associated with dysregulated glycolysis, TCA cycle, urea cycle, and pyrimidine, polyamine and gut microbiota metabolism [98-100]. Cheng and co-workers have described a distinct urinary metabolic profile in CRC patients with altered levels of several metabolites derived from gut microbial-host co-metabolism as well as metabolites involved in the TCA cycle and tryptophan and polyamine metabolism. A panel of seven metabolite markers (citrate, hippurate, p-cresol,2-aminobutyrate, myristate, putrescine, and kynurenate), was able to discriminate CRC patients from their healthy counterparts, with an AUC 0.998 . Polyamine compounds are low-molecular-weight organic cations involved in several biological processes including carcinogenesis. Among natural polyamines, the concentrations of diacetylated spermine and spermidine increase in urine from cancer patients [101-103]. Urinary DiAcSpm and DiAcSpd have been evaluated in BC and CRC patients in two studies [27, 28]. In Hiramatsu's study , urinary DiAcSpm was found to have a markedly higher SE (75.8%) compared with serum CEA (39.5%) and CA19-9 (14.1%) in CRC patients ; in Umemori's study , the SE of DiAcSpm and DiAcSpd in CRC patients was respectively 69.6% and 36.3%. DiAcSpm and DiAcSpd were higher than in controls even in early-stage CRC, and were highest in patients with stage IV disease . CEA comprises a large family of cell-surface glycoproteins with common antigenic determinants residing in the protein portion of the molecule and is the most widely used tumour marker for CRC monitoring [104, 105]. El-Masry and co-workers have developed a Slot-Blot Enzyme Linked Immunosorbent Assay (SB-ELISA) based on anti-CEA monoclonal antibody as a simple, fast, inexpensive, and non-invasive immunodiagnostic technique for CEA detection in urine from patients with gastrointestinal tumours . In CRC patients it provided higher SE, PPV and PNV (respectively 76.7%, 86.3%, and 65%) than the ELISA serum test, which showed 64.4% SE, 79.5% PPV, and 52.2 % PNV. PGE-M seems to be the most interesting and promising urinary marker for CRC and adenoma risk assessment and for CRC screening. PGE-M is the main urinary metabolite of PGE2, probably the major mediator of the effects of cyclooxygenase-2 (COX-2) in colorectal carcinogenesis. COX-2 is abnormally expressed in most CR cancers and adenomas [105,106]. In addition, use of NSAID, such as COX-2 inhibitors, reduces CR adenoma recurrence and enhances its regression, confirming the role of the COX-2-related pathways in CR carcinogenesis [107-110]. Epidemiological studies have consistently shown a 40% to 50% reduction in CRC risk associated with NSAID use [111-113]. Clinical trials have demonstrated that anti-inflammatory agents can reduce the risk of developing colon polyps [114-116]. The chemo preventive effects of NSAID are thought to be largely mediated through their role in the inhibition of COX-2 and PG production [117-119]. As illustrated in figure 2, COX-2 catalyses the conversion of arachidonic acid to PG H2, which is the precursor for several PG including PGE2. Most of the effects of COX-2 on tumour genesis appear to be related to PG2 overproduction. PGE2 is the most abundant PG detected in CR neoplasms and has been shown to inhibit apoptosis, stimulate angiogenesis, and increase cellular proliferation, cyclin, and migration [120-127]. PGE2 levels are elevated in CR neoplasms, and reduction in the expression of 15-Hydroxyprostaglandin dehydrogenase (15-PGDH), which degrades PGE2, is commonly found in CRC [120, 128-130]. PGE2 exerts its cellular effects by binding to its cognate receptor Prostaglandin E2 receptor 1-4 (EP1-4), which is overexpressed in all CRC tissues [123,130]. 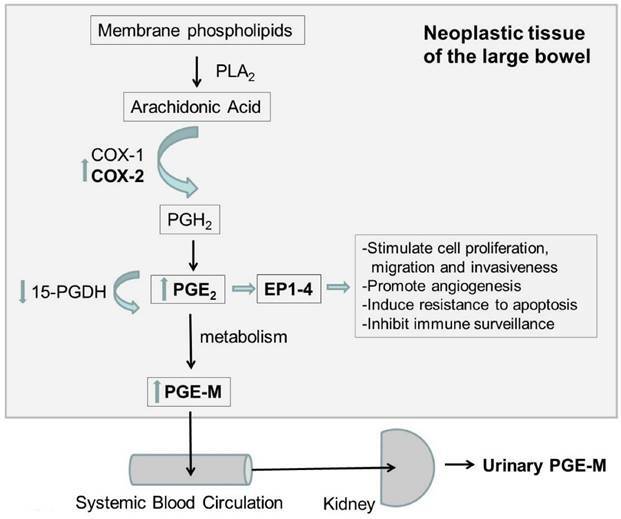 Given the critical role of PGE2 in CR carcinogenesis, it is conceivable that the main urinary metabolite of PGE2, PGE-M, can be a valuable risk assessment tool for CRC. Increased urinary PGE2-M levels are associated with MSTA and advanced adenoma as well as CRC [32-36, 110-113]. Johnson and co-workers found significantly increased urinary PGE-M in patients with CRC and large CR polyps compared with subjects with normal colonoscopies or small polyps . They also found that treatment with a selective COX-2 inhibitor, celecoxib, reduced PGE-M levels among rectal cancer patients. In a prospective cohort study of Chinese women, baseline urinary PGE-M was more than 50% higher in CRC patients than in controls  and was associated with a strong risk for later CRC diagnosis. In a case-control study of CR adenoma, patients with advanced adenoma or MSTA had more than 25% higher levels of PGE-M than controls, whereas differences in PGE-M between controls and cases with a single small tubular adenoma were not significant . Subjects with the highest quartile level of PGE-M shared an approximately 2.5 greater risk of a diagnosis of advanced adenoma or MSTA compared with those with the lowest PGE-M values (OR=2.53, 95% confidence interval=1.54-4.14, p< 0.001). In a recent, prospective, case-control study, Bezawada and co-workers have shown that urinary PGE-M is associated with an increased risk for advanced, large, and multiple adenoma. In addition, aspirin or NSAID use seemed to be more strongly associated with a lower risk of adenoma among individuals with high PGE-M levels than in those with low PGE-M . In a matched case-control study, Davenport and colleagues evaluated both plasma CRP, a pro-inflammatory protein, and urinary PGE-M in four subjects groups: patients with a single small tubular adenoma, MSTA patients, patients with at least one advanced adenoma, and polyp-free controls. There was no apparent association between CRP level and the risk of single small tubular adenoma. A dose-response relationship with CRP was observed for risk of either MSTA or advanced adenoma. Combined analysis of CRP and PGE-M indicated that the risk of MSTA or advanced adenoma was greatest among subjects with high levels of both CRP and PGE-M than in those with low CRP and PGE-M.
Meta-analysis of the data from the five studies confirmed that PGE-M levels are strongly associated with an increased risk for MSTA, advanced adenoma, and CRC. The increase in urinary PGE-M in patients with CRC and large adenomas suggests that urinary PGE-M is a potentially useful biomarker for the detection of advanced CR neoplasms. Subjects with MSTA or advanced adenoma are at greater risk of a recurrence compared with individuals with single small tubular adenoma [131,132]. The finding that PGE-M was related to MSTA or advanced adenoma and not to simple adenoma may reflect a more substantial effect of PGE2 on tumour progression than on carcinogenesis. In conclusion, although colonoscopy remains the most effective diagnostic modality for CRC, it generally suffers from poor patient compliance, high cost, and possible complications. The development of more effective methods for early diagnosis, assessment of disease severity, and prognosis would meet all these problems. Growing evidence suggests that urinary screening tests have the potential to respond to these expectations. Particularly, PGE-M seems to be the most promising urinary marker for CRC early detection. Corresponding author: Prof. Emma Altobelli - Department of Life, Health and Environmental Sciences, University of L'Aquila, Piazzale Salvatore Tommasi 1, 67100, Coppito (Aq), Italy. e-mail: emma.altobelliunivaq.it; phone: +39 0862434666; fax: +39 0862433425. Reprints to: Prof. Emma Altobelli - Department of Life, Health and Environmental Sciences, University of L'Aquila, Piazzale Salvatore Tommasi 1, 67100, Coppito (Aq), Italy.